The FT and Google have partnered with agency adam&eveDDB to bring the favelas of Rio to life for the newspaper's readers using virtual reality. The immersive documentary, with reporting and voiceover by Brazil correspondent Samantha Pearson explores the social dynamics and physical landscape of Rio’s favelas, giving viewers a sense of the Rio behind the Games. The content is free to access on the FT’s website and uses Google Cardboard, which was distributed with the paper on Saturday ((6 August), to give a VR experience on mobile. The release marks the latest stage of the agency's 'Hidden Cities' campaign for the FT and Google and has been timed to coincide with the 2016 Summer Olympics. It is the first in the series to include a virtual reality element, which was created by Visualise. Sam Brown, account director at adam&eveDDB, said: "Hidden Cities is a unique collaboration between two of our existing clients. We’re excited to add VR as a another dimension to the experience, as it means we can give users a deeper connection to the FT’s content, by using Google technology to transport them into the favelas." Sian Cox-Brooker, news and publishers manager for Europe, Middle East and Africa at Google, said: "Hidden Cities Rio is a good example of how technology and journalism can work together. 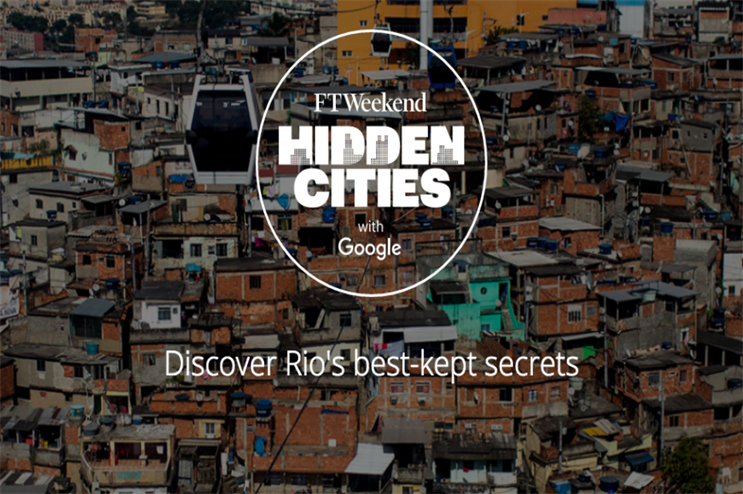 This project builds on our mutual strengths--Google’s technology, combined with FT’s editorial depth, to help people discover Rio’s hidden gems." Natalie Whittle, FT Weekend magazine associate editor and editorial lead on Hidden Cities, added: "This project was a very rich and exciting one to work on - we not only had a chance to look closely at Rio de Janeiro through the eyes of our correspondents and photojournalists on the ground, but also to explore how 360 video can be used to extend the insightful access that we always strive to give our readers." Blog: Are we using VR for VR's sake?